I'm a Monday mornin' wimp. I wake up every Monday morning feeling like I just laid my head on the pillow. Then pull the covers up and try to hide from the immanency of wrestling and wrangling with the challenges of mothering these babes. And, proceed to pull on Jason's pants legs as he's walking out the door. But, I'm hoping that my hot, steamy mug of hot chocolate will send my don't wanna do anything but lay around on the sofa and eat Doritos booty into gear. We bought Spiderman underoos yesterday. And, we pulled out the little potty. Which means I'm crying in my Monday mornin' hot chocolate because I feel like the least qualified person to do any sort of training in relation to anything potty. I did it once. And what I learned from that process is that I'm terribly impatient and I get all frustrated and don't like all manner of pee and poo anywhere but in diapers or pottys and starting this process means that pee and poo are bound to end up in all manner of places unwanted. I'm a potty training wimp, too. But, Max - he's so proud. And, so happy and smiley and all, "Momma, I'm a big boy today and I gonna keep my Spiderman pants dery, dery dwy." That's Monday morning optimism comin' from my Superhero underoo-wearin' boy. Maybe it'll rub off on his wimpy Momma. "Dery, dery dwy." Haha...I love it! You can do it Sarah. Maybe Jack can help guide his little bro in the ways of potty usage. Oh, Good luck! My main reason for not having any more kids, bigger than the money, is that I would have to someday get them from diapers to the potty. And I HATE it! It was so much easier when my second kid got potty trained by the daycare than when I had to train my first and third. And on a Monday!?! Brave, Brave woman. Go ahead and do Lincoln while you're at it. This picture is one of the pictures you're going to sit out on a table when he gets married, isn't it? So that answers my previous question. Hope it's quick and painless!!! I totally know how you feel about Monday mornings!The "reinforcements" (aka husband) goes back to work, augh! :) But somehow we make it to Tuesday...sometimes it is a miracle. Good luck w/ the potty training. I haven't yet approached that w/ my little guy-I think he's still too young. At what age do you typically start and any special tips or tricks? Oh dear Sarah, I hope your potty training day goes well...I have to admit that my little guy has not jumped the fence because this momma is a potty training wimp too!!! As to him knowing who Spiderman is...how do they do that?!?! How do they know about things we've never talked about?!?!? If you figure it out...do tell! Any mommy buying spiderman underoos for her little guy certainly isn't wimping out on the challenges ahead of her! You can do it Mom (and Max)!!! This post is classic Sarah. It's your personality shining through. First, I think we're all Monday morning wimps. It starts with the dread on Sunday evening... and then eeks into Monday morning. Terrible. I didn't feel like my day started until 11. Terrible. Secondly, potty training stinks. It just does. And that's not trying to be punny. Stinks. Monday morning + potty training? Double ugh. Girl, I totally hear you! I am not a fan of potty training, though I did find with my daughter that while she wasn't ready as early as my son was, she did get through it quicker. I think part of that was b/c she had her big brother spurring her on. Good luck!! While we do not use bribery in our house, I did find that "m"s were hugely helpful as rewards for going on the potty. One for pee and two for poop. Two also for waking up dry. We're joining your ranks over here on this side of town. It was my New's Year Resolution to get up the gumpshun to potty train Katie (and she had NO interest), but the thought of her turning 3 soon and me not even trying to help her didn't look so good. So, we're over here trying to do the training thing, although I haven't put her in underwear yet (yes, you are very brave). The pullups have won the battle so far, because I couldn't stand all the clean ups with the first child. Good luck. You can do it! Good luck! 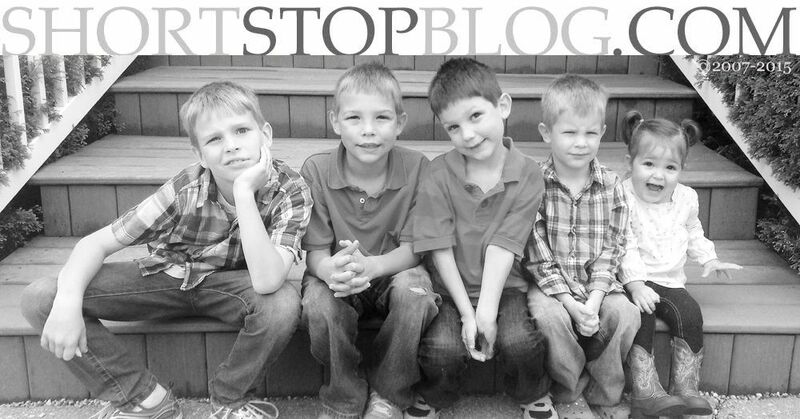 I consider potty training 3 kids to be one of my biggest achievements! Oh, good luck! My two year old manages to pee on the floor WHILE SITTING ON HER LITTLE POTTY. There's talent right there! I hate this part of motherhood, too. BUT, once it's done, it's so easy! No more diapers...except Lincoln's, of course. That is the cutest photo ever. I understand, SS. I realy, really do. I was a potty training wimp, too. Oh, girl. 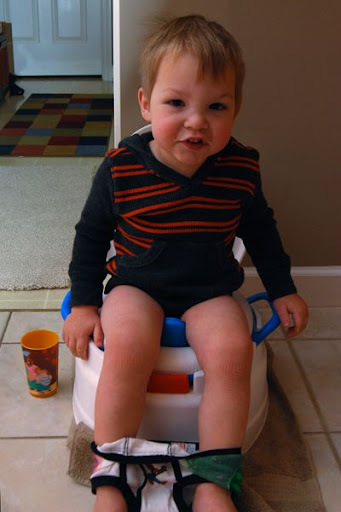 I'm getting ready to potty-train my two-year-old, and I'm so dreading it. She's ready, but I'm not. Good luck to you - hope the whole thing is quick and painless. Good luck Max and mommy! We are right there with you on the potty training deal. I am a potty training wimp too... Lance asked me yesterday if we were really potty training Mauryn or not. When we go out I put her in a diaper but I guess I need to get brave and just put her in underwear and pack the extra clothes, underwear, etc... and plan on doing lots of laundry. And really how do kids get ideas of certain characters in their heads that they haven't been exposed to at home.